PinPoint Rewards. A Solution for Merchants. Learn More with Our Video. PinPoint combines a new business development tool, loyalty program, customer database, marketing campaign and social networking party all in one. When new members join, PinPoint sends them a Welcome Reward from you. Impress eager new customers you haven't even met...yet. Merchants who offer PinPoint Rewards are winning customers away from merchants who don't. PinPoint awards customers for spending at your store with Payback Rewards. Unlike one-and-done coupons and internet "newpons" that give away your profits and abandon you for the next merchant, PinPoint keeps your customers coming back. If they don't come back, PinPoint asks why with automated surveys. Meanwhile, PinPoint reminds customers about rewards expiring soon to create urgency and a call to action. Every PinPoint customer is within your reach. 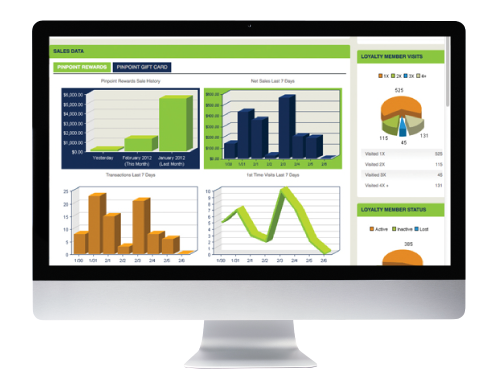 Get the data you need to make intelligent marketing and business decisions with the PinPoint Dashboard. Hear what our valued merchants have to say about PinPoint in their own words. "We have a database of almost 10,000 people we that we can reach at any given time through PinPoint"
"It brings new customers in on a daily basis and then building quite a few repeat ones"
"We were looking for a rewards and retention program"
"The affordability of the PinPoint program is bar none"
Ready to Create a Custom Rewards Program? Questions? Call (800) 659-4922 to consult with a member of the PinPoint team. © 2019 PinPoint Card, Inc. All Right Reserved.